Before reading this book, I hadn’t heard about displaced person camps post WWII, and what an interesting read told mostly through the eyes of a mother and daughter. People lived in these camps, run by the British army, in cramped conditions with little in the way of luxury. The book made uncomfortable reading throughout but brought to life the horrors of the suffering of many people during the war and how they came to terms with life afterwards. Its hard to imagine what one would do in the face of torture while trying to protect those we love but this battle hardened woman comes to life as a depressing survivor/victim throughout this read. It is not all depressing though, and good still exists in spite of the challenges in the camp and the constant threat from an old enemy. The suffering of Jewish people is alluded to throughout, and although this isn’t the theme of the book it is an unpleasant reminder of the evils of those days. Well worth reading for its historical content alone but also for the characters portrayed throughout. The writing style was different from my usual reads and this slowed me down at first but once I got used to it, the book was a compelling read overall. 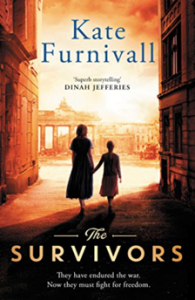 A thoroughly engaging and well-written history of the plight of women during WWII and beyond. The social histories of the women involved were researched in depth and their stories told in a manner that brought them to life through the pages of this book. I was drawn in to each chapter in a different way, some chapters were horrifying, such as the Bethnal Green tube disaster and back street abortions and some were uplifting such as those covering the lives of many of the incredible women who adorn the pages. I particularly loved Dr Joan and will be reading the biography covering her life. Having lived and worked in the East End from 1980-1982 at the London Chest Hospital in Bethnal Green the stories of the matriarchs resonated with me. The reality of developers cutting through the history of the East End (covered in a later chapter) also resonated deeply as this hospital too, has come into the hands of property developers in spite of surviving two world wars! The stories rang true and I understood the need to portray the women as matriarchs and demonstrate their strength in a positive way as they deserve this. My only criticism, and its a small one, is that some of the women may have been romanticised slightly. There were parts of the book, such as those where any hint of ambition was quashed by the strength of the matriarchs and vigilante justice meted out to any who didn’t conform were only fleetingly addressed. On balance, the book shows the strength of these marvellous women in spite of the hardships endured and that was its purpose. 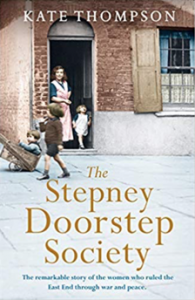 Highly recommended for anyone interested in the East End, war years or matriarchs as I’m sure such stories would be true in any big cities of the era. An engaging and fearful look into the dark history encountered during the English Civil War. This book provides an insight into the chaos and mayhem that occurs when civil war breaks out. This first book in the series is set during the early days of the English Civil War. The very engaging lead character, Tom Fletcher is just a teenager. Tom is the son of a butcher and is expected to follow in his father’s footsteps, something he doesn’t want to do. The book begins with a bang that captures attention immediately through Tom’s attempted suicide and it gathers pace quickly. Tom begins working as a doctor with his cousin before setting off on an errand where he meets with the young Phoebe who has suffered much. After rescuing her from bullies and asking her to join with him on his journey, it is not long before he tires and doesn’t show her the respect she deserves. She is long-suffering and patient with him and he may grow to appreciate her for who she is over time. The journey home results in a fateful meeting with an evil, psychopathic, parliament soldier, who becomes determined to see Tom’s ruin. The soldier causes the young Fletcher much heartbreak and pain. As the civil war spreads through England, Tom meets with soldiers from both sides and determines to stay neutral. He tries hard to avoid the war altogether but finds it impossible. After an altercation with another parliament soldier Tom has to leave home to escape the gallows. During his travels, the young doctor meets with many people who become a part of this well-woven story. Tom saves the lives of many, including a captain, left for dead, and encounters much death and suffering with some, close to home. As the evil soldier closes in on him, Tom finds that his life is in danger as murder and mayhem is wreaked by the man. I loved the author’s writing style, language and grammar throughout the book and found all of the characters to be believable. This is the first in a series of novels about the young Tom Fletcher and I will most certainly be reading the rest. I am intrigued as to what will happen to him next!